Why RTD Ice Dam Removal? Does Insurance Cover the Cost of Ice Dam Removal? If you’re confused about whether or not to call an expert about an ice dam, you’re in good company. It can be complicated knowing when to call and when to sit back and wait to see what happens. Ice dam removal is not necessary in every case. It’s vital that as a home or business owner, you learn to identify the warning signs that an ice dam has become a problem and may soon cause damage to your building. An ice dam that is leaking water into your home or pooling water on your roof is an emergency that should be addressed immediately. If you notice water leaking from electrical outlets or water stains on your walls or ceiling, there’s been a breach in your building’s envelope. Call us for emergency ice dam removal, and we’ll dispatch someone to your location as soon as possible. Unfortunately, smaller leaks are not always readily identifiable and can create costly damage that can go unnoticed for months. Mold damage is a problem when moisture or water penetrates into a building and typically requires professional remediation to deal with the problem. You may consider that it’s better to be safe than sorry when it comes to an ice dam. The quickest solution to an ice dam is to call RTD Ice Dam Removal for emergency service. Many ice dam removal services are still using ineffective methods that take a long time to melt ice and do not effectively remove the ice dam in time to prevent damage from occurring. Other companies use unapproved methods and tools that damage shingles and building structure. We’ve assessed the methods being used and have invested in equipment that does a better job of removing ice dams. 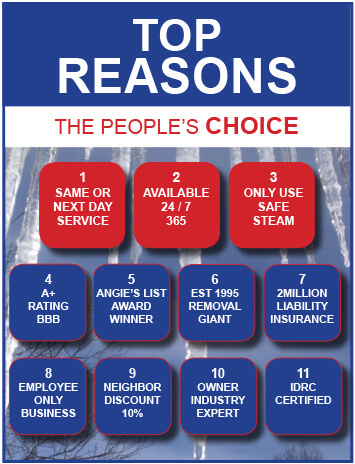 Our wet steam method is the safest and fastest way to remove an ice dam- guaranteed. Low-pressure wet steam cuts like a knife through thick ice dams, slicing ice into smaller blocks that we can remove safely. If you’re not sure whether your present situation is an emergency, give us a call, and we’ll help you determine the best course of action regarding your ice dam. If we feel that the situation is urgent, we’ll come out right away. Call one of our specialists with any questions you have or to request an immediate dispatch to your home or business.